If you wish to purchase multiple items and combine shipping, please email us at gary@russell-optics.com with a list of what you would like listed. I will gladly reply with a discounted shipping rate. "WOW!" is all that comes to mind for this limited supply of old-school JSO research-grade lenses. And here is your chance at some history: quality from when optics manufacturers would strive for perfection rather than profits. Made in Japan and on equal footing with any Zeiss, Pentax, or Leica made. This eyepiece is based on the Premier 4-element Konig design (my personal favorite) which will absolutely amaze you with superb sharpness -- especially for the super-wide AFOV -- contrast and performance that will only be limited by your scope and viewing conditions. This eyepiece is available to you at a fraction of what you would expect to pay for equal performance back in the 80's, let alone if anyone even made them today. Other eyepieces that yield this type of performance would easily be selling for over $200-$350! Russell Optics makes this 2" 7mm Research-Grade Super-Wide-Field Konig with the FINEST Japanese lenses ever made, with very nice multi-coatings! With 60 degrees AFOV, this compares to ANY big-name eyepiece on the market today -- at a fraction of the price! 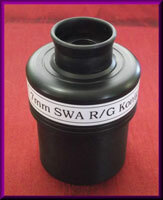 It is also threaded for standard 48mm 2" filters. Limited supply! When these are gone, there will be no more available! 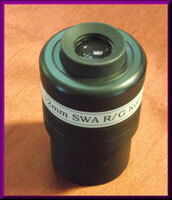 Here is an eyepiece that customers have been asking us to make in a 2" format for years. 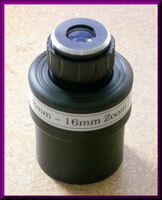 A limited supply 2" Zoom eyepiece that ranges from 8mm to 16mm with seamless, smooth movement by simply rotating the top. Starting at 16mm with about 50 degree AFOV, and going up to 8mm with over 65 degrees AFOV. A Zoom is not intended to replace every eyepiece in your collection, by any means, but there are many times when a person wants a simple set-up that allows them to change from a mid-power view to a high-power wide-field view. Comfortable eye relief, simple twist to change focal length, and superb lenses really make this a must-have for those times you want a simple, lightweight eyepiece that delivers the performance of a whole case full of individual eyepieces. It won't replace your super-wide Konigs or other high-end eyepieces, but a Zoom certainly does have its place in every collection. You may as well get one while they last at a price that is way below affordable -- in a 2" format! Beautiful fully-multi-coated lenses yield superb contrast, excellent sharpness, and detail. Nobody else offers a 2" format Zoom! These housings & lenses are "new, old stock" and may show slight signs of storage, but the lenses and barrel look new. The barrel and lower housing is machined here at Russell Optics & Machine. Russell Optics is known for offering excellent quality at affordable prices, which allows everyone to enjoy the hobby! We spend the time and effort on quality optics and performance, not fancy boxes and/or cute caps with our name on them. We pass the savings on to you, the customer. No fancy frills to raise the price, no "suggested retail" so a middle-man has inflated mark-up. Buy direct, save money, and get great performance at a fraction of what others sell for. 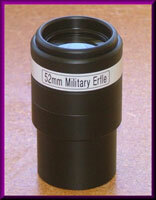 This is a six-element Konig designed eyepiece with 65° FOV! Awesome performance that allows wide-field viewing at higher magnifications for lunar and planetary detail in addition to nebulas and star clusters. Beautiful multi-coated lenses, rubber eyecup, and threaded for standard filters. Generous 20mm eye relief with contrast and sharpness that rivals anything available today. This 12mm 2" Super-Wide Konig eyepiece is a superb mid-power eyepiece with an amazing 70+ degree FOV, with fantastic edge-to-edge sharpness and contrast! Russell Optics makes this 2" 12mm Super-Wide-Field Konig with the FINEST Japanese lenses ever made, with very nice multi-coatings! With 70 degrees AFOV, this compares to ANY big-name eyepiece on the market today -- at a fraction of the price! It is also threaded for standard 48mm 2" filters. Why not have them all? This 13mm 2" Super-Wide Konig fully multi-coated eyepiece is a superb mid-power eyepiece with an amazing 70+° FOV! This six-element Konig design eyepiece that will absolutely amaze you with superb sharpness, contrast, and performance at a fraction of what you would expect to pay for others selling for -- $150-250, or more! This 18mm 2" Super-Wide Konig eyepiece is a superb mid-power eyepiece with an amazing 70+ degree FOV, with fantastic edge-to-edge sharpness and contrast! Russell Optics makes this 2" 18mm Super-Wide-Field Konig with the FINEST Japanese lenses ever made, with very nice multi-coatings! With 70 degrees AFOV, this compares to ANY big-name eyepiece on the market today -- at a fraction of the price! The glass is pristine and the coatings look superb. Eye relief is about 16mm, there is a non-folding solid rubber eyecup, and it is threaded for standard 48mm 2" filters. 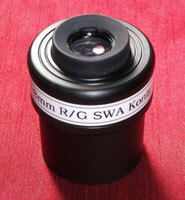 This 2" 19mm Super-Wide Konig is a must-have in every astronomers case. Generous 18mm of eye relief, 70° FOV, superb multi-coated XL lenses that yield some of the finest views you will get out of any type of telescope. Compare this eyepiece to others selling for 4-5 times as much and "see" for yourself why it's our best seller. These are probably the most popular long focal length/low-power eyepiece ever made. 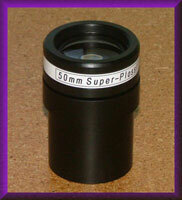 The 50mm 2" Super-Plossl eyepiece is a superb low-power eyepiece with fantastic edge to edge sharpness and contrast! Here is an AWESOME Super-Plossl, 5-element design, eyepiece that will absolutely amaze you with ULTRA-sharpness, superb contrast, and performance at a fraction of what you would expect to pay. Low-power astro-scanning is one of the most impressive and enjoyable things you can do, and viewing from 35x to 55x with a wide-field Plossl it is like looking at millions of diamonds lying on a bed of black velvet cloth! 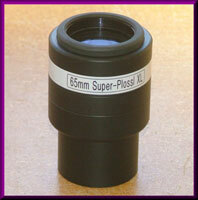 Russell Optics makes this 2" 50mm Wide-Field Plossl with SUPERIOR multi-coated lenses, a 30mm eye relief, and it is threaded for standard 2" filters. Russell Optics is now the ONLY manufacturer that makes the long-focal-length eyepieces! "Why," you ask? It's really simple: the demand for eyepieces over 40mm in focal length is not a large enough market for the "big-guys" to invest their time and money into. Here at Russell Optics, however, we want to serve the astronomers that still want the low-power, super-flat, FOV -- even if it means making an eyepiece that only a few dedicated people still wish for! PLEASE NOTE: This eyepiece works in any scope that accepts 2" eyepieces, but it is suggested that you do not go below 35x in any scope that has a central obstruction (ie. : a Newtonian, SCT, or Mak). If your obstruction is larger than 25% of the primary, you could also get a "ghost" image of that secondary mirror. In a refractor, you can go as low of power as you like. This is probably our most popular long focal length/low-power eyepiece ever made. 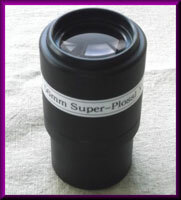 The 56mm 2" Super-Plossl eyepiece is a superb low-power eyepiece with fantastic edge to edge sharpness and contrast! Russell Optics makes this 2" 56mm Wide-Field Plossl with SUPERIOR multi-coated lenses, a 30mm eye relief, and it is threaded for standard 2" filters. Here is an eyepiece design that that was originally introduced by Edmunds and used by the military to produce an affordable widefield eyepiece. It will amaze you with sharpness, contrast, and field of view, at a fraction of what you would expect to pay for equal performance. Others that yield this performance sell for over $200-$350! Russell Optics makes these 2" 52mm & 60mm Wide-Field RKEs with a limited supply of HUGE diameter lenses yielding 55-60 degrees AFOV! The lenses used compare to ANY big-name eyepiece on the market today, at a fraction of the price (if they even made one at all)! The lenses are HUGE, at over 2" in diameter (52mm), with a clear aperture of 43mm (1.700 inches), making it one of the largest eyepieces we make. And, because we use Delrin (an acetyl material originally designed by Dupont for NASA) instead of aluminum, they're not heavy at all! I got a great deal on a limited supply of the lenses and I'm simply passing the savings onto YOU. No middle-man, no dealer discounts, just a small mark-up from the manufacturer direct to you, the consumer. That is exactly how Russell Optics has been doing it since 1998, and is also why we are considered to have the "best dollar-value" in the world on quality optics. These eyepieces have extra-long eye relief, which can be used with eyeglasses, and they are threaded for standard 2" filters. These are probably the most popular long focal length/low-power eyepiece ever made. The 65mm, 72mm, & 85mm 2" Super-Plossl eyepieces are superb low-power eyepieces with fantastic edge to edge sharpness and contrast! For a couple of years, I could not get the "XL" lenses required to make these. I just received a new shipment of these superb lenses and they are available once again! I have had a waiting list for these for over a year now. We are caught up and there is a limited amount left to sell to the public! These were originally designed for use on large observatory scopes for old-school visual viewing. So many people use cameras and CCD chips that monitors have received a lot more attention than actual eyepieces. If you want to look at hi-res pictures, buy a Hubble DVD; if you want to get the full effect, LOOK through this eyepiece! Here is an AWESOME Super-Plossl, 5-element design, eyepiece that will absolutely amaze you with ULTRA-sharpness, superb contrast, and performance at a fraction of what you would expect to pay. We make these eyepieces with SUPERIOR multi-coated lenses, super-long 35+ mm eye-relief, and threading for standard 2" filters. These have LONG eye-relief and should only be used in refractors or long focal length telescopes that can handle the extra low power this offers.